Gov. Mike Parson flanked by House Speaker Todd Richardson, left, and Senate President Pro Tem Ron Richard. Republican Bob Dixon of Springfield, who handled the treatment courts bill in the Senate, touted the courts’ success. It passed the Senate 29-0. Before the vote, Sen. Jamilah Nasheed, D-St. Louis, offered an amendment that would have created treatment courts for those with mental-health conditions. “Mental illness is impacting so many people throughout our state and this country, and no one is really shining a light on it,” she said. Dixon and fellow Sen. Doug Libla, R-Poplar Bluff, expressed support for the idea of mental-health treatment courts. But they opposed Nasheed’s amendment because they feared the House might not only oppose it but could kill the bill by adjourning from the special session. Meanwhile, majority floor leader Bob Onder, R-Lake St. Louis, praised the STEM bill passage. 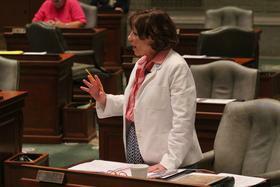 It passed 28-1, with the lone “no” vote coming from Sen. Jill Schupp, D-Creve Coeur. She expressed concerns over provisions in the bidding process for STEM curriculum vendors and over allowing students to substitute a computer-science course for math. Parson vetoed earlier versions of the STEM and treatment court bills, citing concerns about how they were written. Lawmakers agreed not to override the vetoes in exchange for passing alternate versions this week. The special session will end next week when House and Senate leaders sign the bills before sending them to the governor.